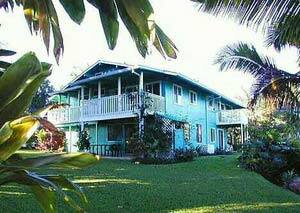 A beautiful Hawaiian-style home located just a block from the magnificent 2-mile white sand crescent beach at Hanalei Bay. Set back off the road down a long driveway this lovely home is private, quiet, secluded, and has wonderful views of our lush, tropical landscaping and the adjacent conservation area. Flowering bushes and trees, papayas and bananas and myriad birds abound. 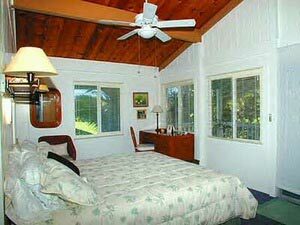 It is just a 5 minute walk into quaint, historic Hanalei town with its array of restaurants, galleries and shops. 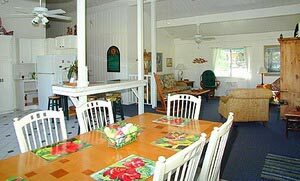 The outstanding beaches of the North shore are minutes away, as are snorkeling, diving, hiking the Na Pali, kayaking, golf, riding, windsurfing, boating.The house will sleep up to 12 people in 3 separate units which may be rented individually to smaller groups. We do not rent to 3 separate groups at the same time. Please see our web page for photos and more information. Books, games, puzzles, toys, all beach accessories - chairs, mats, towels, coolers, boogie boards. Frisbees, basketball, volleyball. It was a great place for the twelve of us to stay in. 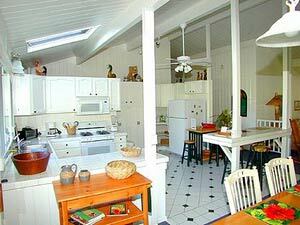 Very clean and Very close to the beach. 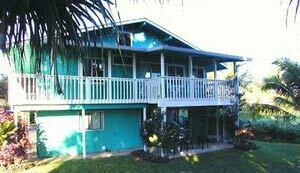 Special low season and last minute (less than 30 days) rates - please inquire. Rates listed are for entire house. 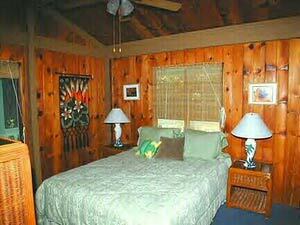 See our web page for rates for individual units which may be rented separately. Cancellations and Refunds: Cancellations less than 60 days in advance will receive refund if owner can rent the home to another party.